If you are looking for flowering plants for a low maintenance garden landscape, Anigozanthos should be on top of your list. Since they are native of south-west Australia, these hardy perennials would grow as very nice flowering plants in a dry and hot climate. Commonly known as Kangaroo Paws, Anigozanthos are popular for their nice and usual flowers that also attract flocks of birds. 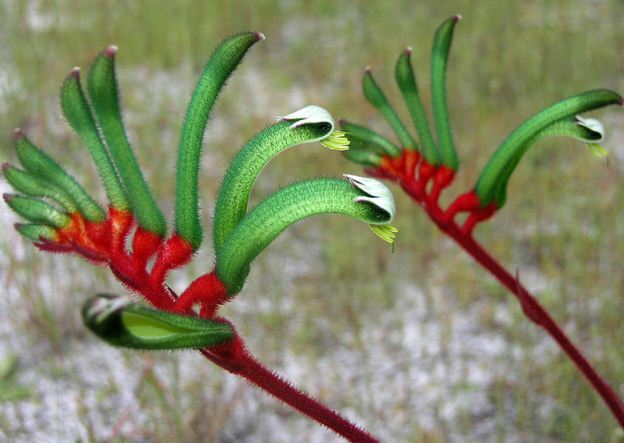 Most species of Kangaroo Paws bloom in spring and summer; flowers vary in size and colors and appear on a long stalk exposing the nectar in the flowers. Kangaroo Paws grow in a well-drained soil, and prefer and sunny, warm places in the garden. They need protection from frost and grow well without requiring much water. Propagation is easy from divisions or seeds sown in early spring or autumn. Kangaroo Paws also make good cut flowers for floral arrangements. Popular varieties of Kangaroo Paws are: Anigozanthos ‘Bush Ranger‘ with orange flowers, Anigozanthos ‘Dwarf Delight‘ with apricot colored flowers, Anigozanthos Flavidus with yellow and green flowers, Anigozanthos Manglesii with red and green flowers, and Anigozanthos ‘Pink Joey‘ with Solomon pink colored flowers. About the Author: This guest post is compiled by Jahanzeb Nazir Malik who is an avid gardener, an environmental activist, and a lawyer by profession. He also writes his blog on food, culture, art, entertainment and architecture. Rhipsalidopsis Gaertneri or Easter Cactus is an epiphytic plant from Brazil and is best known for its showy flowers. It belongs to the group of ‘leaf cacti’ – the name given to Schlumbergera and Rhipsalidopsis because of their thin stems that look like leaves. 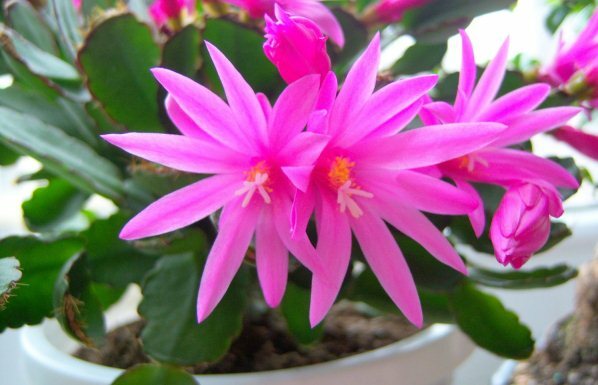 Easter Cactus produces abundance of branches that are erect or pendant and bear showy flowers on their tips. Easter Cactus comes from rainforest areas of Brazilian coastline where they grow as epiphytic plants under the shady trees. Thus when growing them as houseplants, Easter Cactus would require humid and frost-free climate in a semi-shaded spot. They can be grown indoor as well as outdoor, however, care must be taken to provide natural sunlight when grown indoor and to ensure moisture when grown outdoor. Easter Cactus can be propagated easily from stem cuttings. Allow the cuttings to dry for a couple of days before sowing them in the soil. Provided Easter Cactus with a loose, coarse and well-drained soil fertilized with a general purpose fertilizer. Flowers of red and purplish-pink color start appearing after the cold spell of winter is over and bloom till the end of spring. Flowers on Easter Cactus remain open during the day and close at night. A well-branched Easter Cactus bearing large, showy flowers in a hanging basket is a very rewarding experience. Scabiosa is a genus of prolific bloomers distributed across Asia, Europe, Mediterranean and many temperate regions of the world. 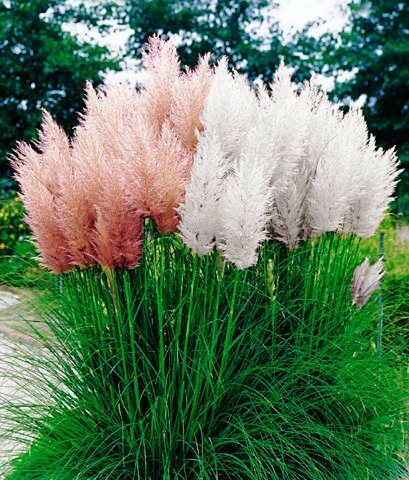 They are easy to grow and fill empty spaces and borders very nicely in gardens and landscapes. Scabiosa forms low mounds of decorative leaves and bears nice flowers of creamy white, lavender and lilac colors. Flowers are borne on a long stalk. Scabiosas are commonly known as Pincushion flowers. Scabiosa is easy to grow and requires almost in any soil but prefer well drained and rich media. Grow them in full to partial sun with regular watering though they can survive frost and drought to some extent. Propagation is easy from seeds as well as divisions. Scabiosa Africana: A shrubby, evergreen perennial, Scabiosa Africana bears white or mauve flowers. 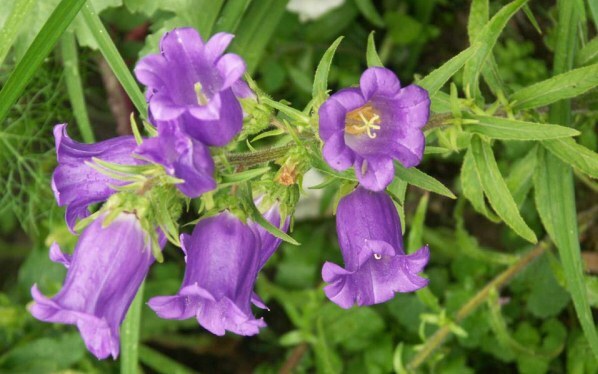 Flowers grow in spring and can be used as cut flowers. Scabiosa Atropurpurea: It is an annual plant and bears flowers of white, pink, crimson and purple. 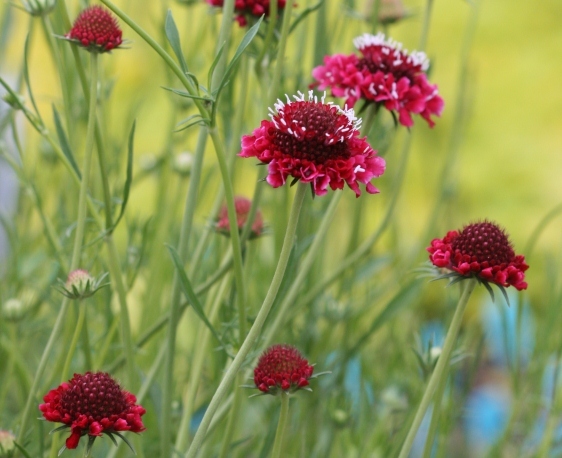 Other popular varieties and cultivars include Scabiosa Columbaria ‘Baby Blue’, Blue Diamonds, Butterfly Blue, Perfect Alba, Pincushion Pink, Pink Lemonade, Pink Mist, and Ultra Voilet. Charming fragrant flowers, bright showy leaves, and tendency to grow beautifully against trellis and walls make Mandevilla a popular houseplant. Native to tropical regions of Central and South America, Mandevilla is an easy to grow climber. 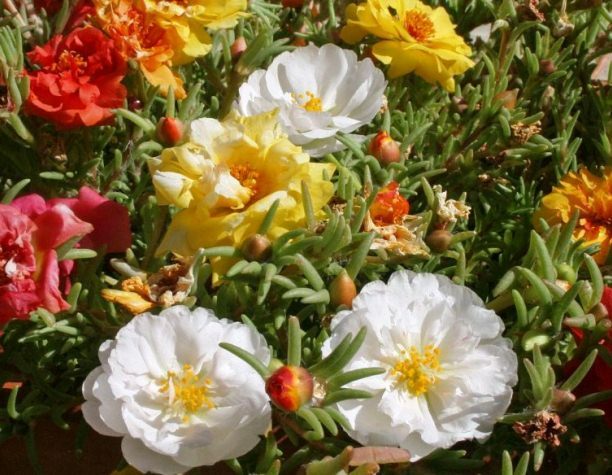 These summer bloomers bear attractive flowers of pink, white, yellow and red colors. 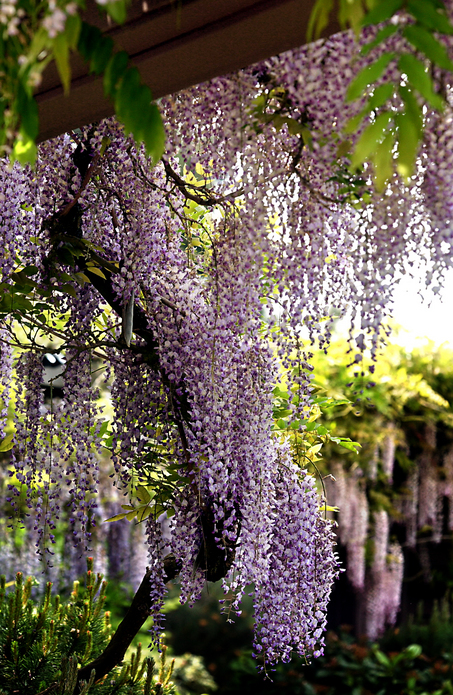 They can be grown in hanging baskets, against fences, trellis and over pergolas. Mandevilla demands well drained and rich soil. For profuse flowering, provide your Mandevilla plants with bright but filtered sunlight in a warm spot. Water and fertilize them regularly; avoid overwatering and protect from frost. The easiest way to propagate Mandevilla is from softwood cuttings. Mandevilla Splendens: A beautiful summer bloomer, Mandevilla Splendens bears showy flowers of pink color. The plant grows as an evergreen creeper and can be grown in hanging baskets. 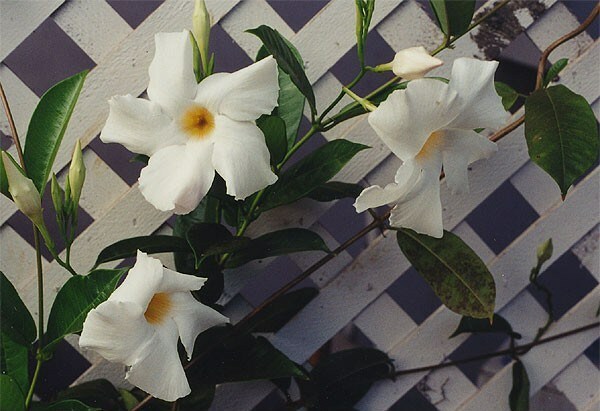 Mandevilla Laxa: Also known as Chilean Jasmine, Mandevilla Laxa grows as a deciduous vine. Growth is often vigorous and requires pruning of wood stems. Flowers are fragrant and can be used in flower arrangement to add colors and fragrance. 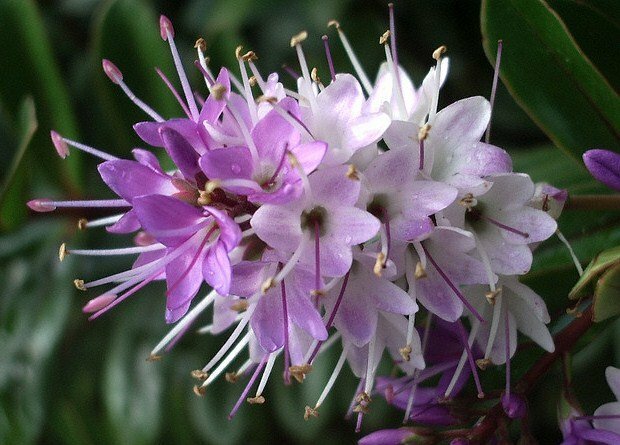 Native of New Zealand, Hebe is a genus of beautiful flowering shrubs with glossy leaves and attractive flowers of purple, blue, white, pink and mauve colors. Flowers are small and appear in the form of spikes. These frost resistant shrubs are a good choice for hedging especially when used as wind breaker. Hebe requires regular water and bright sunlight. Most species of Hebe are fast growing in coastal climates and should be pruned regularly to form neat flowery hedges. Hebe would grow almost any soil but it prefers well drained and slightly acidic soil. Hebe is propagated from seeds and cuttings. Hebe x Andersoni: It is a small shrub with lavender flowers and glossy leaves that often tend to variegate. Hebe Speciosa: It is a winter flowering shrub and bears purple flowers. Hebe Salicifolia: A summer bloomer, Hebe Salicifolia produces abundant flowers of light pink color in summer. For further information on Hebe, the best source is The Hebe Society website. Ceanothus is a genus of about 50-60 flowering shrubs (up to 3 meters) and small trees (up to 7 meters) that bear fragrant blue, pink, white or lilac flowers. Both evergreen and deciduous varieties of Ceanothus are available for growing as ornamental flowering plants. Ceanothus are at their best when blooming in late spring or mid-summer. Flowers are tiny but densely clustered to form a rich display of soft and fragrant blooms. With a little effort, Ceanothus can be trained to form effective ground cover, hedge or climber. Prune only when required, the best time to prune Ceanothus is after the end of flowering spell. Most species of Ceanothus would grow from softwood cuttings sowed in later spring or mid-summer. Propagating from seeds can be challenging. In winter, soak Ceanothus seeds in hot water for 12 hours and then store them at 1° C for three months. Sow stratified seeds when temperature is between 16-18°C. Germination may take one to three months. Once established, Ceanothus is easy to care. It requires well-drained and mulched soil, average watering under full sun, and protection from frost. 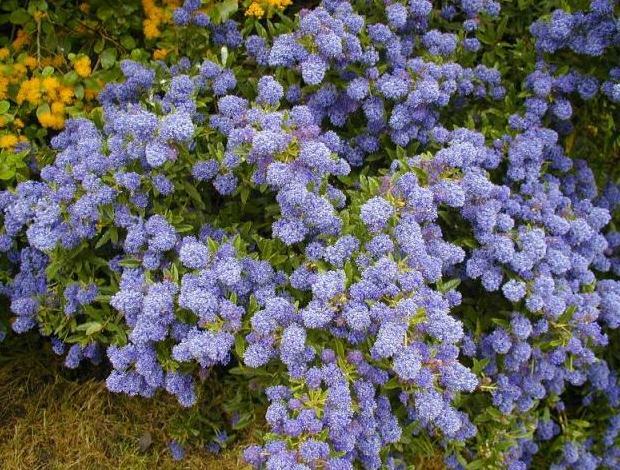 Ceanothus is not a hungry plant and can grow on nutrients available in soil and water without any extra feed. Ceanothus Concha (Californian Lilac): Suitable for alkaline soil; withstands drought, grows up to 4 feet, makes a bushy plant and blooms in late spring. Ceanothus Delileanus (Gloire de Versailles): Another bushy variety. 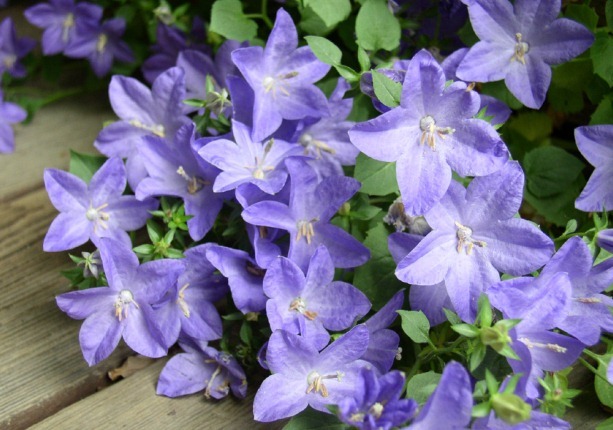 Gloire de Versailles is deciduous and bears pale-blue flowers from mid-summer to autumn. Ceanothus , ‘Blue Mound’: An evergreen shrub, producing dark-blue flowers in late spring. Blue Mound can grow as tall as 5 feet and, spread up to 6 feet. Ceanothus, ‘Autumnal Blue’: Autumn Blue is evergreen, grows upright and bears light blue flowers in late summer. It can grow as tall as 10 feet. Ceanothus ‘Puget Blue’: One of the mostly cultivated varieties of Ceanothus, Puget Blue makes a good flowering shrub. Ceanothus Thyrsiflorus (Skylark): Excellent climber and prolific bloomer. Skylark flowers blooms in late spring or early summer.